Like all moms, I don’t want my son getting sick. Nothing pains me more than seeing my boy suffering from an infection or illness. I always want to see him happy and healthy. That’s why I make it a point to give him nutritious food plus vitamins and nutritional supplements. He takes 5ml of Growee and 5ml of Ceelin Plus every day. I checked his baby record books and realized that as early as 1 year old, he was already prescribed Growee by his pediatrician (2.5 ml daily then). Growee is a food supplement with vitamins (Vitamins A, D3, E, B1, B2, B6 and B12), essential nutrients (niacinamide, taurine, lysine, choline) and Chlorella Growth Factor (a growth enhancer). For his Vitamin C, his pediatrician alternated different brands, but now we’re using Ceelin Plus. Ceelin Plus is an apple-flavored syrup that has 100mg of Vitamin C and 10mg of Zinc. Vitamin C strengthens immunity, while Zinc not only boosts immunity but also prevents growth stunting. Aside from being healthy, I also wish my 6-year-old son to grow as tall as my younger brother who is 6 feet tall. I hope to achieve these goals with the help of Growee and Ceelin Plus. What vitamins and food supplements do you give your kids? This entry was posted in Ceeliin Plus, Growee. Bookmark the permalink. Hi Mommy! my son’s vitamins are Growee and Ceelin too. Sulit namn because he rarely gets sick. Mommy , ask ko lang po .Ano po ung proper time na pagpapainum ng growee para sa baby ? may baby is now 11months old pahelp po .Thank you ! I think it’s best to ask your child’s pediatrician regarding this. I usually give my son his vitamins in the morning before he goes to school. For my toddler, it’s also Ceelin Plus. Dati, he used to drink Growee pero hindi hiyang sa kanya. So the pedia recommended an appetite booster. Oh, I forgot the name kasi parang sa pedia nya lang mabibili (not sure, though) but right now, I’m giving him Appebon with iron. My 4-year old son is a Ceelin Kid and I mean to give the same to my newborn when she’s old enough. 🙂 We haven’t tried Growee though, just it’s competitor brand but would love to try it some time! I also give my daughter Ceelin to boost her immune system. 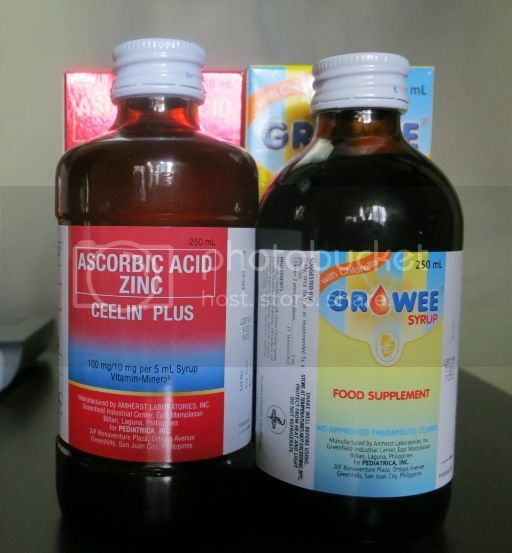 My daughter also takes Growee and Ceelin for her supplements but as of now, we are advised by the pedia to stop since her weight is already for 5 years old. These two are good sources of vitamins and minerals that helps to boost the immune system of the kids. we are also using them, i trusted ceelin for many years. My baby is 7 month-old. Is it advisable to give her a combination of Growee Drops with Ceelin Drops? What would be the dosage? I want to order this product, but i live outside in the country want Ceelin plus and Growee syrup Food Supplement. I two boys 9 and 5 years old. helo… ako din ceelin and growee syrup din gamit ko for my 2 year baby boy, ummm sulit nman dahil bumigat siya den bihira po talga siya magkasakit.. At napansin ko din na magana siya sa pagkain.. So for me sulit siya. Mommies, I am new mom, i have 15mons old baby, he used to be underweight as per his age, dito sa bansa na tinitirhan namin vit D lng prescribed ng mga doctors, pina checkup ko naman siya sa pinas pero wala din nirecommend ang pedia.. so just thinking even without prescriptions baka pwede ko na siya bigyan ng vit supplement, btw the doctors here prescribed him a ferros dahil daw sa mababa ang iron, my iron-deficiency siya.. since small malimit na kami sa hospital due to sipon at lagnat, after niya mg iron medyo hindi na siya naging sakitin, tapus na ang iron taking niya so gusto ko na siya patabain, he was not that picky, he eats everything (thanks God).. but i really bother about his weight at size, maliit siya kung tutuusin.. any suggestions mga mommies, thank you.. I suggest you ask for a second opinion from another pediatrician who could help you get the answers you need to properly care for your baby. my boy is 4 years old and im giving him growee and ceelin plus every night after suffer. Is it ok?. Then his weight did not fit to his age because he’s already 28 kls. What should i do? plsss help me. Thanks for leaving a comment. I think your son’s pediatrician would be the best person to ask about what vitamins will suit his needs.